I don’t know about you but this past long weekend overflowed with indulgent food around here….flooded, really, and I have not a single complaint. All good things in moderation, right? It started with date night with my much better half that consisted of oh so good eats…that included but was not limited to: pork belly, shrimp scampi, spinach salad with bacon and a soft boiled egg (that I will be recreating immediately) and a stop at my favorite ice cream joint for dessert. This was just one night, my friends. We also enjoyed some amazing local bbq and met some family and friends for, by far, the best burger in the Twin Cities…I will even throw myself out there and put it up against the best burger known to human kind. I’m still drooling..and somehow those ridiculous burgers get more and more enjoyable each time we have them. If you’ve never been, please treat yourself and go…life changing, I swear. So, needless to say, we were ready for a light, refreshing meal last night. 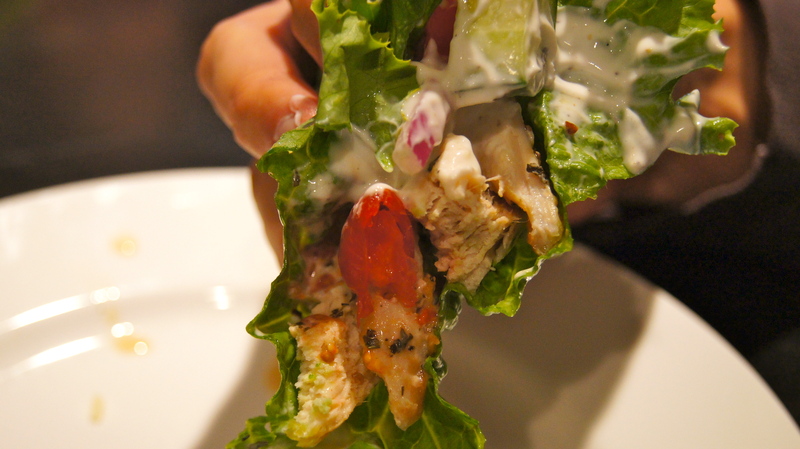 I give you…Mediterranean Chicken Lettuce Wraps. In the good old days of newlywed life living downtown we often ate these wraps at our local neighborhood bar; they usually followed a couple of bloody mary’s on a Saturday afternoon. My gosh that life seems like so many moons ago and as much as I loved every ounce of it I wouldn’t take it back for the world. What’s different now? Instead of following a couple of bloody mary’s they now follow a long day of changing dirty diapers, washing crayon marks off the walls and reasoning with a 1.5 year old on why Paddington the Bear is not allowed to take baths in the potty. I mean, who needs bloody mary’s? Truly, these wraps are even better than what we got at the bar. They are so satisfying and the flavor is just top notch. They make a great, fast weeknight meal and I have even served them as appetizers at cocktail parties. Once you make these they will become a regular in your kitchen…your’e going to love them. Be sure to slice the chicken after it has rested while it is still in the pan…this allows you to coat the slices with all of those savory pan juices. My husband took one bite and I ran to get the camera…I mean look at this! So many layers of awesome flavor…and you see the juice drippings on his plate? You should be sold by now. Preheat oven to 400 and season both sides of the chicken with greek/mediterranean seasoning. In an oven proof skillet heat olive oil over medium high heat. Add the chicken and cook, top side down, until you get a nice sear on the top, about 4 minutes. Flip chicken over, transfer to the oven and roast until cooked through, about 15-20 minutes. Remove from the oven and let chicken rest in the pan for about ten minutes so the meat can absorb all the pan juices. 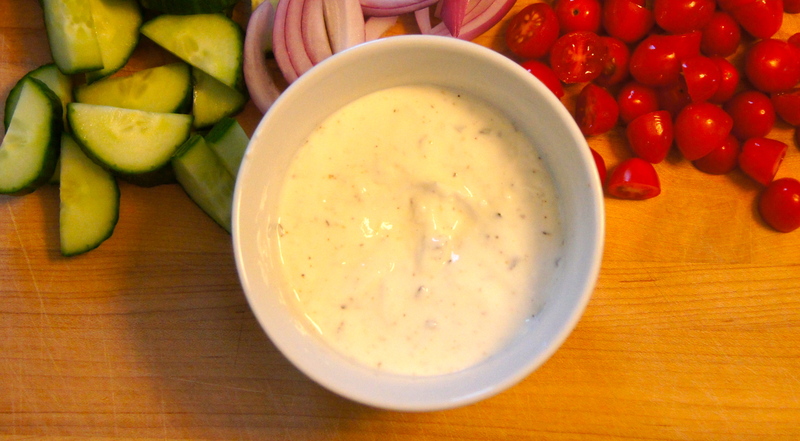 While the chicken is cooking combine yogurt, lemon juice, garlic, mint, salt and pepper in a small bowl. Stir well to combine. Can be made 2 days ahead and stored in the refrigerator. 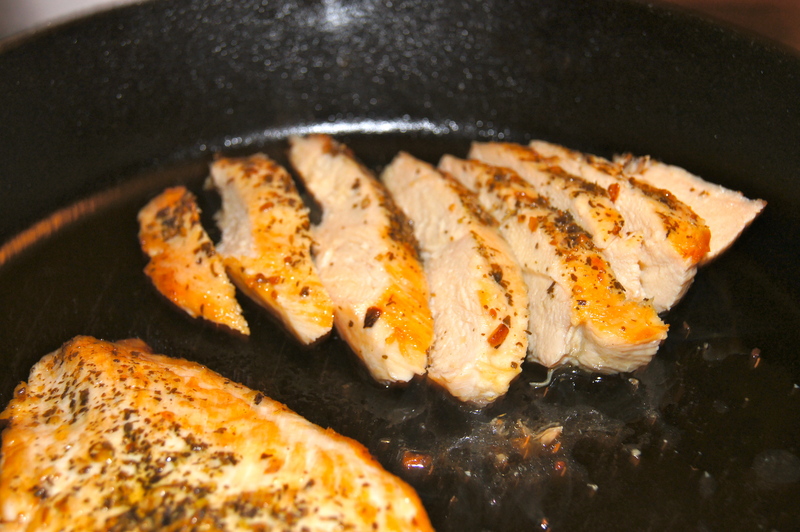 Slice the chicken while it is still in the pan and stir the slices around to coat them in all of the pan juices. Serve chicken on top of lettuce leafs and top with a spoonful of the yogurt sauce, cucumber, tomato and onion, if desired.